It's cold here, but I am enjoying the opportunity to stay home where it's warm! So glad to finally have time to play along with the Mojo Monday sketch and to use my new Stitched Flower Dies. Love your beautiful card and those lovely stitched flowers. Thanks for linking up to the CropStop blog! Just beautiful! Love the colors and pretty flowers. Happy New Year, Christine. Thanks for joining us for Mojo Monday! Beautiful card! Love the colors and the Bible verse! Lovely card, wonderful sentiment. Thank you for joining us at Jo's Scrap Shack. 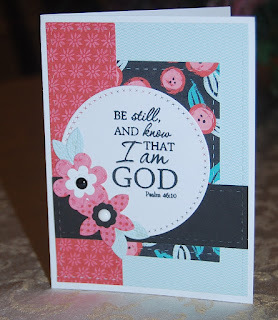 This is such a great design - I love your colour choices too, love your pretty card. This is absolutely GORGEOUS, Christine. Thanks so much for sharing your wonderful art in our challenge. I'm grateful for you, and for your continued faithfulness to our challenge blog. Your art has always been, and continues to be, such a tremendous blessing to me. Have a great week and please join us again soon.